Good things do come in small packages. Wellington may be little, but this diminutive capital city is big on funky café culture and beautiful views. Snuggled between steep forest-clad hills and a wide sweep of bay looking out to Cook Strait, Wellington spreads out across the slopes, and a sturdy pair of walking shoes benefits visitors who want to explore outside of the central district. Luckily, the main tourism highlight - the magnificent Museum of New Zealand (Te Papa) - is down on the flat waterfront, and the quaint Wellington Cable Car provides a scenic and extremely cute alternative to puffing up the hill to the Kelburn Lookout. Due to the city's position, capturing the blustery conditions right on Cook Strait, it has gained the nickname of 'windy-Wellington,' but don't let that put you off. On a blue-sky summer's day there really is no prettier city in New Zealand. Wellington's antique cable car has been chugging up the hill to the Kelburn Lookout, next door to the Botanic Gardens, since 1912. This quaint journey is a scenic (and much more relaxed) alternative to puffing your way up Wellington's steep hill from Lambton Quay in the waterfront central district. There are excellent views across the city along the way, and keen photographers will definitely want to get snap-happy with the cityscape panoramas laid out before them once at Kelburn Lookout. The Kelburn cable car terminal also has a small museum, which displays the original cable car used on the tracks. New Zealand's finest museum is an immersive journey into the natural forces that formed the country, the culture of the Maori people who first settled here, and the social history of both Maori and Europeans who have shaped the nation since then. The Museum of New Zealand (more commonly called Te Papa by locals) has a wealth of exhibits to explore, from the Earthquake House that simulates the experience of being in an earthquake to the much more sedate Arts Te Papa collection with 11 galleries of artworks focused on New Zealand and Pacific Island artists. The highlight of the museum though is the Mana Whenua exhibition, which traces the history of New Zealand's Maori with a fine collection of Maori art and treasures and state-of-the-art multimedia displays. State-of-the-art multimedia displays help bring Wellington's history to life in this small but impressive museum housed in a preserved historic building that was once one of the city's early department stores. Informative exhibits and film presentations trace Wellington's maritime history and the city's evolution. In particular, the exhibits on the 1968 Wahine disaster (the sinking of the Wahine ferry near Wellington harbor during a storm claimed 51 lives and is New Zealand's worst maritime disaster) are a sobering and thoughtful reminder of the power of nature and Wellington's connection to the sea. There is also a very well presented gallery focused on Maori myths and legends. Wellington's most iconic building is The Beehive - site of New Zealand's parliament. Designed by British architect Sir Basil Spence and built between 1964 and 1979, the building with its distinctive shape is the city's most love-it-or-hate-it piece of architecture. Next door is the more classical building of Parliament House, built in 1907 in Neoclassical Edwardian style and home to The Chamber where parliamentary debates are held. Free one-hour tours of the parliament buildings are held daily between 10 am and 4 pm and trace New Zealand's parliamentary history as well as touring through the important government rooms. They leave from the visitor center on the ground floor of The Beehive. The parliament gardens around the buildings are open to the public and contain rose gardens and a statue of Richard John Seddon who was prime minister of New Zealand between 1893 and 1906. Wellington Botanic Gardens is a lush oasis that sprawls for 25 hectares on the city hillside, full of blooming flower displays and native fauna. A series of walking tracks meander through the gardens from conifer forest areas to ferneries and seasonal flower beds. The Lady Norwood Rose Gardens here are one of the botanic gardens' finest attractions with 110 rose beds boasting a flurry of different varieties. The Carter Observatory, with its planetarium show, is sited in the eastern section of the gardens (near the Wellington Cable Car Kelburn Terminal), and the gardens are also home to Begonia House with tropical flower species displays. Dedicated to exhibiting New Zealand's conservation efforts and its unique nature and wildlife, Zealandia is a 225-hectare urban eco-sanctuary only two kilometers from the central city. Here, many of the country's native birds, including endangered species such as the stitchbird, saddleback, and takahe can be heard and seen as well as more than 100 kiwi (which can be spotted on guided night tours) and New Zealand's famed reptile, the tuatara. There are 32 kilometers of walking trails throughout the reserve for visitors to explore plus a museum that documents the natural history of the country. This small wooden house in the Wellington suburb of Thorndon was the childhood home of New Zealand's most famous author. Katherine Mansfield (1888-1923) was a short fiction writer whose modernist prose has been highly influential both in her home country and overseas. Most of the writing she became famous for was completed in London where she moved as an adult and was friends with D.H. Lawrence and Virginia Woolf. The house where she was born and grew up has been restored to its original condition and is now a museum housing many of Mansfield's personal belongings as well as typical furniture and fixtures of the late 19th-century. Housed in the historic building of the old city library, City Gallery Wellington is one of the leading contemporary art spaces in New Zealand with a changing program of temporary exhibitions throughout the year displaying artworks by both renowned and up-and-coming local, Pacific Island, and international artists. Devoted to modern visual arts, exhibitions range from painting to photography to sculpture, multimedia work, and art installations. The gallery is also one of Wellington's main cultural hubs with a series of talks, meet-the-artist events, and live performances taking place throughout the year. Wellington's oldest surviving original cottage was built by William Wallis in the 1850s as a home for his family. It has been painstakingly preserved with many of the Wallis furniture and fixtures in place to recreate the ambience of family life in New Zealand's pioneering era, while outside is an organic heritage garden. Entry to the house is via a guided tour (four times daily) that allows visitors a taste of colonial Wellington and details the history of the Wallis family who lived here for three generations. The garden area is open to tourists throughout the day. Nine kilometers south of the central city, in the Houghton Bay district, is the sandy cove of Princess Bay. This sheltered sweep of sand with plenty of rock pools is a favorite swimming and picnicking spot for locals during weekends in the summer months. On a clear day, the beach affords excellent views that can stretch across to the South Island. A short coastal track above the beach runs to a lookout point with even better views and is popular strolling territory in the late afternoon. For nature lovers looking for a secluded getaway close to the city, Matiu Island (also known as Somes Island) in Wellington Harbour offers up a heady dose of wild New Zealand landscapes. During the pre-European era, Matiu Island was occupied by Maori. During the modern era, it was used as a quarantine station, internment camp, and military installation until being turned over to New Zealand's Department of Conservation as a nature reserve. For both day-trippers and overnighters, the island has a series of short hiking trails up to its highest point, with World War II gun emplacements, and around the its perimeter, all with excellent views across to the mainland. Regular daily ferries depart from Queens Wharf to the island, and a campsite accommodates overnighters. Wellington Zoo is the oldest zoo in New Zealand, established in 1906, and is well known for its conservation efforts. If you have little ones in tow, this is an excellent place to see some of New Zealand's wildlife up close, especially shy animals such as the kiwi bird (the country's national emblem) and the tuatara reptile. There are also plenty of well-maintained enclosures for animals from across the world including the Malayan sun bear and the giraffe, monkey, chimpanzee, meerkat, and big cats. The zoo's animal hospital, known as The Nest, can be visited to see the work of the zoo's veterinarian staff. 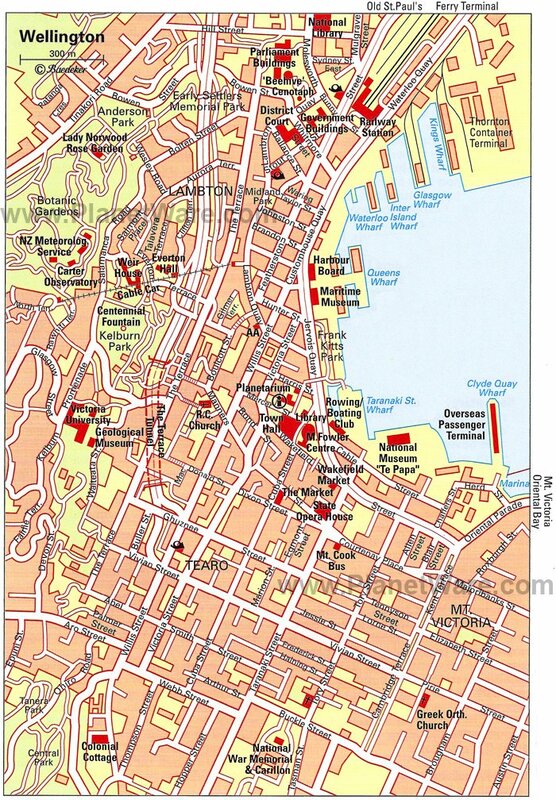 Wellington's waterfront area is an attractive district right in the hub of the central city. Both Queen's Wharf and Frank Kitts Park are surrounded by fine buildings, including the Civic Centre and the Museum of New Zealand. From Frank Kitts Park, there is a good view of Wellington Harbour, and the park hosts a market every Saturday. There are plenty of cafés and restaurants in this area, so it's a great place for a pit stop while strolling the central city. InterContinental Wellington: 5-star luxury, excellent location, harbor views, pillow menus, wonderful concierge staff, valet parking. At Home Wellington: 4-star boutique hotel, contemporary apartments with kitchenettes, friendly hosts, home away from home, comfortable beds. Copthorne Hotel Wellington Oriental Bay: mid-range pricing, water views, indoor pool, 24-hour room service. The Cambridge Hotel: budget hotel, 1883 building, dorm rooms, shared bathrooms, communal kitchen.